Inside JR Kyoto Station is Isetan, and down on the B1 Floor is a Liquor section that puts all other department stores in Kansai to shame. At first I thought it was some kind of joke. I couldn't believe what I was seeing. Row after row of Ji-beer, crazy names and labels, but BEST of all, dozens of representatives from Kansai! So I walked out of Isetan the proud owner of two bottles of local brew; Kinshi-Masamune Craft Beer. 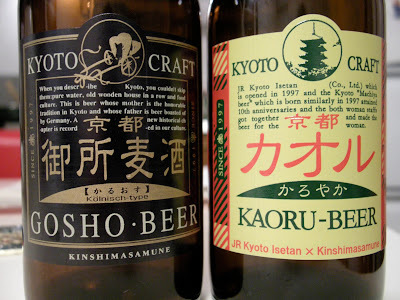 2 bottles only, 'Gosho Beer', and the 'Kaoru Beer', which particularly caught my attention with the words 'JR Kyoto Isetan X Kinshi-Masamune' printed down the bottom of the label. As is quite normal here, Kinshi-Masamune is actually a Sake Brewer who brew their own craft beer. 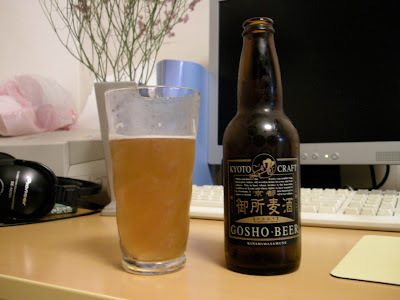 I enjoyed my Gosho! A surprisingly smooth beer with a wonderful colour. It was also very lightly carbonated, as you can see from the absence of a head in the picture below. Now, I can't verify this any more that what I read directly off the label; but with the Kaoru beer, apparently the female staff of both Isetan and Kinshi-Masamune got together to brew this one, especially for women. Which probably explains it's light flavour and fizziness. At 4% it was a nice refreshing one. Support local! Drink Kinshi-Masamune Craft Beer, Kyoto!